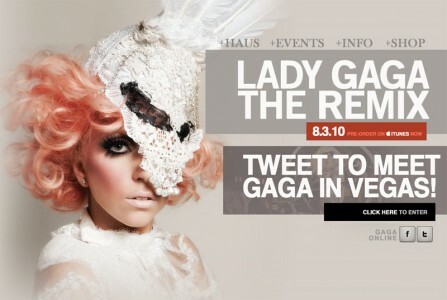 The Abbey invites you to attend the official record release party for Lady Gaga’s newest album, THE REMIX. The event will be held Tuesday night from 9PM to 2AM, with a costume contest to be held at 12:30PM. Come dressed in your favorite Gaga-esque attire for the costume contest, and enter for the chance to win concert tickets and CDs, as well as additional prizes including a “Soul to Soul” couples massage at Ciel Spa at SLS Hotel at Beverly Hills. Those attending are said to include Dule Hill (Psych, The West Wing), Anna Kournikova, Lauren Gottlieb (So You Think You Can Dance, Glee) Dayanara Torres (former Miss Universe), Matthew Everett (Grammy Winning Producer), Reggie Brown (The Obama Effect), Emma Zerner (model/actress), Mayra Veronica (recording artist), Jessica Hall (Kendra, That Morning Show, Hollywood 411″), Katie Cleary (America’s Next Top Model, Deal or No Deal), Julia Anderson (True Beauty), Purple Melon (recording artists), Karissa Shannon (The Girls Next Door), Sam Jones III (Blue Mountain State, Smallville), additional guests to be added.